Reducing sedentary time can improve physical, metabolic and even mental health. Studies that found that sitting less and standing more is a very important lifestyle change.We were simply not designed to sit for long periods of time. When you stop moving for extended periods of time, it’s like telling your body it’s time to shut down and prepare for death. Dr. James Levine, co-director of the Mayo Clinic and the Arizona State University Obesity Initiative and author of the book Get Up! Why Your Chair Is Killing You and What You Can Do About It, has dedicated a good part of his career to investigating the health effects of sitting. His investigations show that when you’ve been sitting for a long period of time and then get up, a number of molecular cascades occur. For example, within 90 seconds of standing up, the muscular and cellular systems that process blood sugar, triglycerides, and cholesterol—which are mediated by insulin—are activated.All of these molecular effects are activated simply by carrying your own bodyweight. These cellular mechanisms are also responsible for pushing fuel into your cells and, if done regularly, will radically decrease your risk of diabetes and obesity. In short, at the molecular level, your body was designed to be active and on the move all day long. If you have an office-based job, one of the most effective ways to achieve this is to use a standing desk. •Heart: When you sit, blood flows slower and muscles burn less fat, which makes it easier for fatty acids to clog your heart. Research published in theJournal of the American College of Cardiology, for instance, showed that women who sit for 10 or more hours a day may have a significantly greater risk of developing heart disease than those who sit for five hours or less. •Pancreas: Your body’s ability to respond to insulin is affected by just one day of excess sitting, which leads your pancreas to produce increased amounts of insulin, and this may lead to diabetes, according to research published in Diabetologia . •Colon Cancer: Excess sitting may increase your risk of colon, breast, and endometrial cancers. The mechanism isn’t known for certain, but it could be due to excess insulin production, which encourages cell growth, or the fact that regular movement boosts antioxidants in your body that may eliminate potentially cancer-causing free radicals. 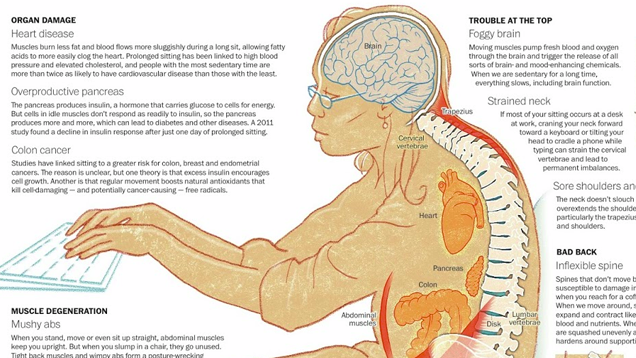 Negative Impact on Brain: Your brain function slows when your body is sedentary for too long. Your brain will get less fresh blood and oxygen, which are needed to trigger the release of brain- and mood-enhancing chemicals. •Strained Neck and Shoulders: It’s common to hold your neck and head forward while working at a computer or cradling a phone to your ear. This can lead to strains to your cervical vertebrae along with permanent imbalances, which can lead to neck strain, sore shoulders and back. •Back Problems: Sitting puts more pressure on your spine than standing, and the toll on your back health is even worse if you’re sitting hunched in front of a computer. It’s estimated that 40 percent of people with back pain have spent long hours at their computer each day. The disks in your back are meant to expand and contract as you move, which allows them to absorb blood and nutrients. When you sit, the disks are compressed and can lose flexibility over time. Sitting excessively can also increase your risk of herniated disks. •Standing requires you to tense your abdominal muscles, which go unused when you sit, ultimately leading to weak abdominals. •Hip Problems: Your hips also suffer from prolonged sitting, becoming tight and limited in range of motion because they are rarely extended. In the elderly, decreased hip mobility is a leading cause of falls. •Varicose Veins: Sitting leads to poor circulation in your legs, which can cause swelling in your ankles, varicose veins, and blood clots known as deep vein thrombosis (DVT). •Weak Bones: Walking, running, and engaging in other weight-bearing activities lead to stronger, denser bones. Lack of activity may cause weak bones and even osteoporosis. When using a standing desk it’s recommended you split your time 50-50 between standing and sitting. And when you stand, make sure you don’t hunch! Also, make sure you don’t have any subluxations in your body as extended standing or sitting could aggravate it. Check with your chiropractor for any issues with your spinal alignment.